Howard University affirms that the central purpose of a university is the pursuit of truth. The discovery of new knowledge through scholarly research. The teaching and overall development of students and the transmission of knowledge and learning to the world at large. The establishment and maintenance of a community where there is freedom to teach and to learn, however, is dependent on maintaining an appropriate sense of order that allows for the pursuit of these objectives in an environment that is both safe and free of invidious disruption. Rules and regulations are necessary to mark the boundaries of this needed order. However, the rights of the individual demand that honest}’, integrity. Responsibility, and respect for persons and property must form the core values upon which those rules and regulations are based. All members of the University Community share a mutual responsibility to practice these values. It is expected that student conduct will be in concert with and supportive of the University’s central purpose and core values. Examples of prohibited student behavior are described in this Student Code of Conduct (“Code”). Circumstances that reasonably indicate a violation of the Code will give rise to the immediate consideration of adjudication through the University’s judiciary system. The Code is applicable to all validated officially enrolled students and all persons admitted to any academic program- activity or event. The terms ‘student” or “students” as used in this Code refer only to those who meet this definition. It is the responsibility and duty of students to become acquainted with all provisions of the Code. 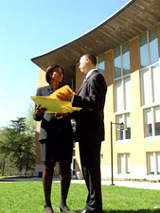 It is presumed that every student, from the date of his/her initial enrollment at the University, has knowledge of the Code, the Academic Code of Conduct, the University Code of Ethics and Conduct, as well as policies and procedures contained in the H-Book, the Bulletin and the Student Reference Manual and Directory of Classes. All students are deemed to have agreed to the Code and are required to adhere to the Code as a condition of their enrollment as a student of the University.